In the midst of all the carpools and soccer practices and dance lessons and schoolwork and constant swirl of activity with busy families, there are words. Conversations. Discussions. And lots and lots of opportunities for you to encourage your child and motivate your potential entrepreneur, budding CEO, or just all-around smart girl. It can be easy to let the days slide on by without being intentional in our communication with our kids. 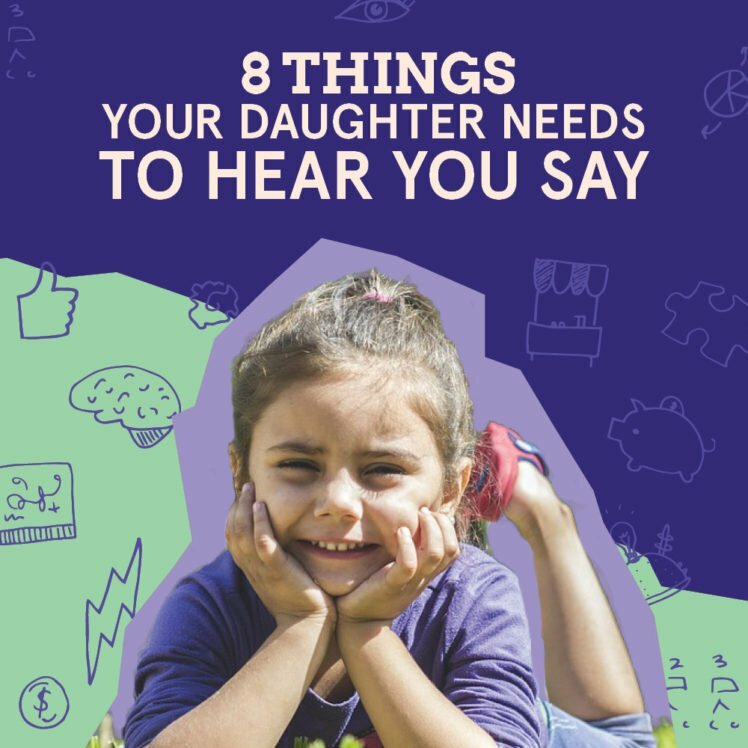 But when you have a moment to slow down and focus, here are eight different ways you can encourage your daughter and tell her how amazing she is, instill a measure of self-confidence, and cheer her on to become the best possible version of herself. Catch her doing something good. As parents, it’s natural to spend a lot of time correcting our kids or pointing out mistakes. Flip the switch and look for something positive. “I really appreciate that you put the dishes in the dishwasher after school, and not just the sink.” “Thanks for helping your brother with that math problem.” “You only slept in five minutes past your alarm! Great job.” Positive affirmation is contagious; she may start doing the same with you! Point out something positive in a negative situation. Failure is part of life, especially for people like pioneers or entrepreneurs who are stepping out on limbs, taking risks and forging new paths. If you want a daughter who’s not afraid to fail, begin now to assuage that fear by helping her see the upside of something that was less than successful. “Well, we didn’t sell much lemonade, but your idea to sell those chewy brownies was brilliant. The one customer we did have needed two more cups of lemonade to wash it down!” When children feel good about themselves and know that you’re okay with trying and failing (and, in fact, encourage it versus not trying new things at all), they’re more willing to persevere and take new risks. Talk about each day’s roses, thorns, and buds. At dinnertime or before bed, ask your daughter about one of her day’s successes (a rose), one problem or mistake (a thorn), and one thing she is looking forward to tomorrow (bud). You can share yours, too. It’ll help her see that there are peaks and valleys throughout life, and success isn’t about avoiding the downturns; it’s about how you handle them, bounce back, and move forward. Show her the big picture. Ask her to solve problems on her own. The problems she’s capable of handling independently, anyway. “Mom, my soccer jersey is dirty, and I have a game tomorrow!” Instead of rifling through her hamper yourself, maybe answer, “That seems like something you’ll need to take care of in the next 12 to 24 hours then. What’s your plan?” Or, let’s say she’s promised the neighbors she’ll babysit for them on Saturday, but now she wants to back out because she got invited to a birthday party. “Hmm. How do you think it would be best to handle that?” Problem-solving is an important and valuable skill for anyone, let alone a successful entrepreneur. Help her identify her passions. Tell her that you’re proud. It’s one thing to praise or celebrate her accomplishments, but what about her character? “You’re such a loyal friend, I’m so proud of how supportive and encouraging you are.” “When you hugged your sister after her bad day at school yesterday, I was so proud of you. You have a big, compassionate heart.” Most of us—kids especially—indulge in too much negative self-talk. When you tell your kids what’s great about them, you interrupt that internal negative loop and help build their self-confidence. Think about it for a second: Who was the last person who said that to you? A parent, your spouse, maybe a mentor? Those are four powerful words that probably aren’t spoken enough, and if you’ve ever heard them, they likely lifted your spirits, ignited a fire, re-fueled a waning determination or simply gave you the chutzpah you needed to tackle a project or face an intimidating challenge. Whether your daughter is risk-averse or a little daredevil; whether she’s innovative or prefers the status quo; whether she’s ready to take on the world or needs a nudge out of her comfort zone—she needs to hear this from you.